Sure, using a temp-to-hire strategy allows businesses to see how an employee fits into their company culture. But that advantage loses a lot of its benefit when you consider the shrunken hiring pool that businesses are selecting from when deploying the temp-to-hire model. When a business is filling a temp-to-hire role, they’re restricted to selecting from a talent pool of unemployed candidates. With unemployment at a 20-year low of 3.9%, that means that businesses using temp-to-hire are excluding over 96% of the potential candidates from their hiring pool. Imagine you’re shopping for a new car, and the dealership only lets you select from 3.9% of their inventory. The chances of finding the perfect car for your unique needs in that limited group is paper thin. That’s precisely what you’re doing when excluding the vast majority of potential candidates from your talent pool. When you’re selecting from such a narrow talent pool you end up hiring the best of the unemployed rather than the best of the best. Your chances of finding the best overall fit is like finding the proverbial needle in a haystack. With those long odds, you’re most likely going to have to settle on a candidate. In the hiring world, settling is never good. Settling forces a business to compromise on some of the job requirements (experience, skills, culture fit, etc.) they laid out in the beginning of the hiring process. When you settle for a candidate that isn’t a perfect fit, you’re going to spend a lot more of your company’s precious time and resources getting the employee up to speed. Even if you defy the odds and land a great-fit candidate with the temp-to-hire model, there’s the lingering risk that they’ll be poached by a competitor. Temp-to-hire employees don’t have much in the way of job security, so they usually will continue looking for jobs while they’re contracting for your business. If a competitor presents your temp employee a direct-hire offer, the decision is a no-brainer for your temp employee to accept the offer and the added job security that accompanies it. When your temp-to-hire employee gets swooped up by another company, you’ll be forced to restart your hiring process and recommit time and resources into training a new employee. What Should Companies Do Instead of Temp-to-Hire? If companies want to avoid the inherent risks in filling workflow gaps with the temp-to-hire model, they should instead opt to bring on a short-term temp to plug the immediate production needs (Mr./Mrs. Right-Now), and then begin a detailed search to hire the best long-term candidate for a direct-hire position (Mr./Mrs. Right). If your company doesn’t have the time to conduct a long and thorough job search, partnering with experienced staffing and recruiting firm is the best way to accelerate your hiring process. 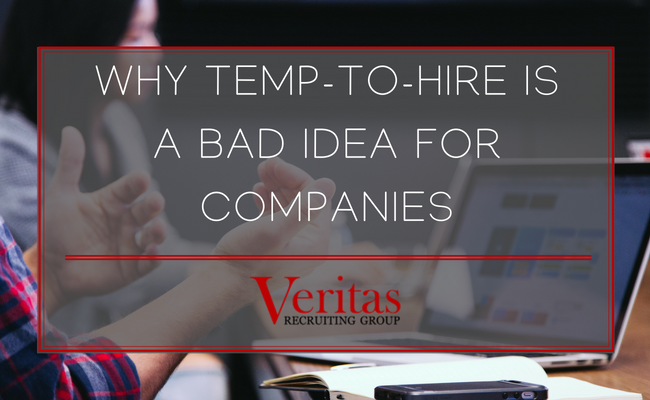 Learn how the Veritas Recruiting Group can both short-term temp and long-term direct-hire services to solve your workforce needs.